After her schooling in ‘Loreto Convent’ Asansol, she pursued her MBA followed by B. Ed. 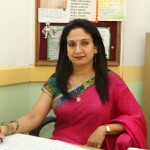 Being a teacher at heart she has been teaching from last 12 years in ICSE, CBSE, IB & IGSCE boards. She is School Co- ordinator and Activity Incharge. She firmly believes that a student needs to think, talk, play, laugh, interact, be instilled with values and take part in curricular activities and not just cramming the syllabus. As a teacher she is trying her best to impart knowledge in a manner so as to shape all overall personality and character of students. Apart from giving them the knowledge of Economics she constantly trains and counsels them to believe in themselves so that they can fulfill their dreams. The children may be far from their homes but it is her earnest endeavour to make them feel a part of the ever growing Aryan Family.